Organic Mung bean sprouts are, like alfalfa, a staple of sprouting. The sprouts are easy to grow, substantial and delicious. They are great in a sprout mix, as a garnish in soups and salads and a key ingredient in stir fries and other oriental cooking. Directions: Soak 6-8 hours in 4 parts room temperature water to 1 part seed; Some smaller seeds can be soaked for 3 to 4 hours. Rinse and drain. Spread evenly in sprouter. Sprouts must be rinsed and drained 2 times per day and can be kept from light until the 3rd or 4th day. Taste test as you grow. Warm room temperature increases growth; cold slows it down; 68º to 75ºF is fine. Some white fuzz may appear at first, but these are natural capillary roots. Rinse the hulls away by immersing in a large bowl of cool water, separate clumps, let hulls float to the surface and skim off. This process will help prevent fermentation. Refrigerate in glass jar or plastic bag after sprouting. Sprouts are best fresh and used within 2-3 days. Sprouts should have a fresh smell. 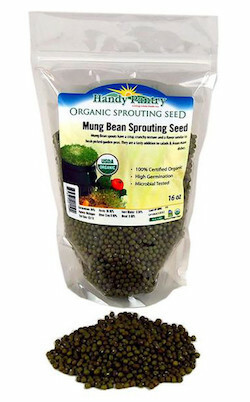 Ingredients: certified organic mung bean sprouting seeds.